The data presented by and available through this web site consists of information from a	variety of private, local, state, and federal agencies and non-governmental organizations,	which is integrated into a single web location (i.e., portal) for the Klamath Basin, southern Oregon and northern California. This website is provided as a public service by Klamath County, Oregon, as a cooperative effort	with these private, local, state, and federal agencies and non-governmental organizations	(the "Participants"). Neither the Participants nor any other entity providing access to	information through this web site, nor any of the Participant's employees, Consultants	or Subcontractors, make any warranty, express or implied, including the fitness of the	information for a particular purpose, or assumes any legal liability or responsibility for	the accuracy, completeness, usefulness of any information, product, or process disclosed, or	represents that its use would not infringe on privately owned rights. The user of this	application assumes all responsibility and risk for the use of the information for any decision	made as a result of this information, available from this server and the Internet in general. The user alone is responsible for the application and interpretation of this information and	is responsible for use consistent with an appropriate level of caution. This is a DEMONSTRATION application initiated by Klamath County, Oregon, with the	express purpose of applying and evaluating new and emerging technologies in an effort to share	information pertaining to water supply, natural resource and social and economic issues	associated with water and resources management in the Klamath Basin. The vision is a common	base of information to guide discussion, debate and resolution of the complex economic,	social, and resource management issues within the Basin. The development of this	demonstration application is guided by a formal document which identifies various future tools and applications. Those interested in participating may contact the Klamath County Public Works Department (lhickey @ co.klamath.or.us). The user formally acknowledges that this is a DEMONSTRATION application and	acknowledges and accepts the Disclaimer of Liability upon entering or using components	of this application. One of the tools available through the Klamath Basin DSS is something called a "Map Viewer." The Map Viewers available through this DSS are web-based applications, which allow "distributed" geo-spatial information and databases to be shared, integrated, viewed and used to analyze resource issues. Current technology allows the data to be distributed, meaning that the geo-spatial data or databases do not need to physically reside on the same computer. By using various standards and specifications (see www.opengeospatial.org), data can be made available through and easily integrated into a single web application. The value in using these standards and specifications is the integration of various data sources within a web browser environment made readily available to a broad range of users without the need for extensive training or skill development. The cost associated with the maintenance of the Map Viewer is also reduced because the data is maintained by the data creator. A Map Viewer has the ability to place the power of data and information in the hands of a broad range of users. Watershed Viewer - This general viewer contains a variety of layers useful for decision support. Watershed Project Viewer - This viewer focuses on the restoration activities happening in the basin. 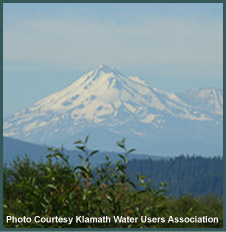 KlamathMap - This viewer focuses on accessing GIS information within Klamath County.